The A-series pallet stacker with reach fork moves goods forward and backwards using scissor fork extension system. 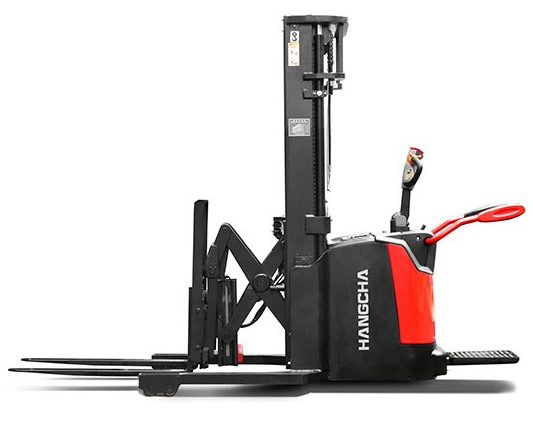 It acts as a counterbalance stacker when the fork is extended, which can handle non-standard pallets, enclosed pallets and enclosed shelves easily. It also acts as a straddle stacker when its fork is retracted, helping to operate in a narrow passage. An electric steering powered system offers easier and more flexible operation, whilst the AC driving motor features excellent acceleration performance and outstanding climbing ability. What’s more, the latest AC Curtis AC control system produces stable control, for better and more accurate lifts. Drivers can enjoy a much better driving experience thanks to a lower vibrational pedal, which helps to reduce fatigue during long operational periods. The optimised structure also guarantees excellent visibility and easy access and exit of the pallet.